Previously I discussed the historical price of gold. Generally people think of gold as an investment more than silver. But silver is a precious metal and can be bought as an investment just the same as gold. A relative of mine bought some silver as an investment during the boom in the 1970's and it took decades for the price to return to the level that he paid. Today I'll look at how the price of silver has varied over the years. The Silver Institute has a history of the price of silver. They discuss why silver went up and down over the years and go into detail about a large boom and bust in silver prices around the 1970's and 1980's. The history they give is an interesting read and I'd recommend checking it out if you're interested. As I write this in November 2008, spot silver is trading for about $10 an ounce. Earlier this year silver peaked over $20. The Kitco website has historical data on silver prices. [edit additional] Note: The numbers shown in the graphs above are the annual average prices. This graph is meant to show long term trends in silver prices and not short term fluctuation. The annual high and low prices are not shown. 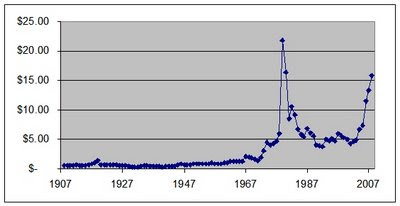 From 1908 to 1965 silver didn't go up too much. Silver was commonly used to make coins. In the USA our nickels, dimes and quarters were made of silver up until 1964. This kept the price of silver fairly steady since it was tied directly to the value of currency. After 1965 silver started to go up in value. From 1965 to 1979 silver rose from $1.29 an ounce to over $21 an ounce. For that 14 year period it had an annual average growth rate of 22%. Then the boom busted and by 1985 silver was down to under $6 an ounce. 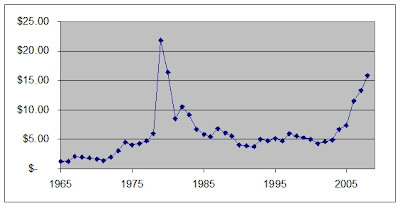 From 1979 to 1985 silver dropped at an average annual rate of -20%. Silver started another boom around 2004. From 2003 to 2008 silver climbed from less than $5 to over $20 at its peak. From 1965 when silver was $1.29 to its current price of about $10 silver has had an annual average increase of about 5%. Silver has had a couple large booms and busts. The price has been very volatile. Overall as an investment silver has not performed very well. Given the high risk due to volatility you would be much better off investing in stocks or real estate.